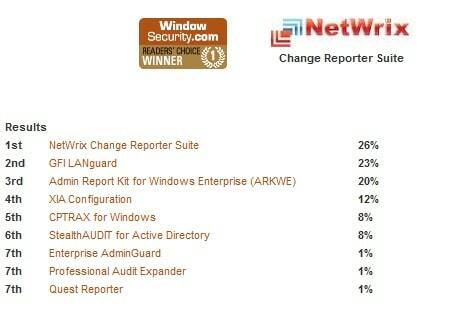 We are pleased to announce that NetWrix has just been honored with another great award – this time thanks to WindowSecurity.com readers – making it the 17th award within the two-month period. WindowSecurity.comconducts monthly polls to discover which product is preferred by Network Security administrators in a particular category of third party network security solutions. The awards draw a huge response per category and are based entirely on the visitors’ votes. Just about a month before getting this honor NetWrix VMware Change Reporter won a VirtualizationAdmin.com Readers Choice Award which made it a second important award from TechGenix Media – one of the largest providers of free high quality technical content to IT professionals all over the World.